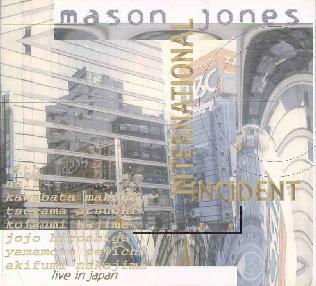 Mason Jones - "International Incident"
Mason Jones (of SubArachnoid Space) continues to explore the sonic and aesthetic possibilities of noise on this live set from two tours of Japan in 1995 and 1997. Each of the five tracks is from a different performance and features different collaborations. This is psychedelia in its harshest form, being simultaneously atmospheric and ear splitting. Both mind expanding and brain crushing. The opening track pairs Mason with guitarist K.K. Null for an extended workout that brought sweat to my brow. Much of it reminded me of a noisier, more psychedelic version of Fred Frith and Henry Kaiser's collaborations. Perhaps not the best of comparisons, but the freeform and avant nature of these excursions are similar. Only one of the five tracks features a band situation, with Mason and Kawabata Makoto on guitars, Tsuyama Atsushi on bass, and Koizumi Haijime on drums. This was my favorite track which I enjoyed for its raw, almost playful improvisations. It has a garage band feel that I found appealing. The band jams away furiously and like a 60's acid band only with more feedback, reverb, volume, and violent screeching than anything the 60's could have imagined. The third track returns to the guitar duos pairing Mason with Jojo Hiroshige on 15 minutes of total guitar mayhem. It amazes me the sounds that can be wrenched from a guitar. This is much like a some of the purely electronic music I hear, only the guitars are creating the atmospherics. These guys take Hendrix to the limit. For his pairing with guitarist Yamamoto Seiichi, Mason takes a seat at the drum kit cranking out wildman tribal beats while Seiichi plays the most purely psychedelic guitar on the disc. Mason Jones is active among the Japanese noise-rock scene and I found this release to be far more listenable and enjoyable then much of that genre. Psych fans who crave blistering mayhem rather than a trippy floating experience will love this. For more information you can visit the Charnel Music web site.